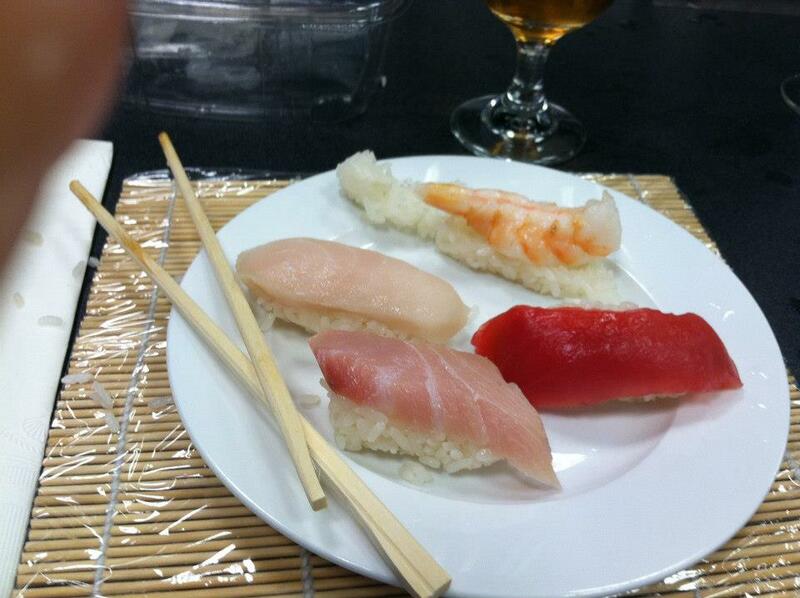 It’s been over 3 years since I wrote on this blog although I have not given up on my culinary adventures. I’ve had latent thoughts about returning but with many life changes I was never able to come back and pick up where I had left off. I want to continue but with a few changes in mind. Namely not limiting this blog to merely recipes but restaurant reviews, food and health information that I have found to be interesting, foods that I have tried, and anything food related. Look forward to being back and interacting with everyone! Sigh. I’m surprised that it is well past summer and fall has emerged. Summer was a long, busy summer which I longed for it to end and continue equally. I feel like summer left with me with memories of a whole year and now I’ve begun 2011. Many things changed. I grew as a person as I learned, read, and thought. I’m in a place that I never expected to be but then again I never had much planned out past the age of 20. Everything is like a new pair of shoes, trying to wear them in so that they’re more comfortable, making sure it’s worth the price. With that said, I’m not sure I will be continuing this blog. I need to keep up with my recipes no doubt. I still have a passion for food but maybe I might take a different turn on this blog or add to it. I haven’t decided yet. It’s something that I’m going to leave open and hope that I’ll find my way back here soon. During the Islamic month of Ramadan, it has been family tradition to prep food for the month of fasting beforehand so we have more time to spend worshiping. We usually make and freeze three different appetizers so all we have to do is cook them when we want them. One of the three that we make is called Patties which is puff pastry stuffed with ground meat. We usually use ground beef but sometimes we’ll use ground chicken as well. It’s one of my favorites and we make them throughout the year as well to have as a light snacks or if we have an unexpected guests visit. The filling is quite easy to make but it takes sometime filling all the puff pastries. It helps to have a helping hand. Take out puff pastry from freezer and set on counter to defrost. Wash the meat in a colander. Make sure you squeeze out the water before adding it to a pot. Cook the meat on medium heat with adding in the salt, red pepper, cumin, coriander, garlic, ginger, peas, Serrano & hot peppers. Water will leach out of the meat and cook the meat. Once the water has dried up and meat is no longer pink, take off of heat. Stir in the mint and cilantro. Let the meat mixture cool down until room temperature. Once its cooled down, stir in the onion and green onions. Preheat oven to 350 F. The puff pastry should be defrosted by now. It shouldn’t be too hard or too soft. If your puff pastry hasn’t already been cut into squares, cut the sheet into equal squares. Take one end of the square and fold it to the diagonal corner. Crimp one side so it’s a triangle, closed on one side. Fill the pastry with the meat mixture till its nearly full. Close the open side by crimping the edges. Repeat until meat mixture has run out. At this point you can either choose to freeze the patties in the freezer in Ziploc bags or bake them. If you’re going to bake them, line the oven with a sheet of foil paper. Place the patties on the foil. Whisk an egg yolk and brush the tops of the patties with the egg yolk with a pastry brush. Bake the patties for until the tops of the patties have turned red. Cool down and enjoy with ketchup or a chutney of your choice. I grew up eating Pakistani food that my mother would cook quite often but she would also make us “American” for lunches and such. I didn’t realize how much I like American food when I went overseas to Pakistan and would have Pakistani food night and day. I would have the biggest cravings for a burger or for a simple sandwich, just anything that tasted American. I don’t think I’ve ever been denied Pakistani food so I haven’t had a chance to miss it. I do love certain dishes and the best weekend mornings are when my mum makes Undai Payaaz ka Salan (Scrambled Eggs & Onion) with homemade flatbread. I love the warm bread with the soft eggs and onion melting into your mouth. I was craving some in the past weekend and learned how to make it from my mum. If your tired of plain ol’ scrambeled eggs, definitely try this recipe out. Its quite simple and has a lot of flavour. In a non-stick skillet, heat up some oil on medium heat. Sautee onions with the whole cumin. Add in 1/2 tsp salt and green peppers. In a large bowl, whisk together eggs, cilantro, and green onions. In a small bowl, combine allspice, 1 tsp salt, ground cumin & coriander, red pepper, turmeric, crushed red pepper, black pepper and 2 tbs water. Once onions are slightly brown, add in the spices mixture. Mix well and stir in the egg mixture, stirring in circles till the egg mixture scrambles. Take off heat and serve with homemade flat bread. What type of food can you not live without? I had a brunch to go to a week ago which I was really looking foward to. It was an AMAZING brunch and I had my first Lox sandwich there which I totally fell in love with. I decided to make some brunch-y desserts to bring along. 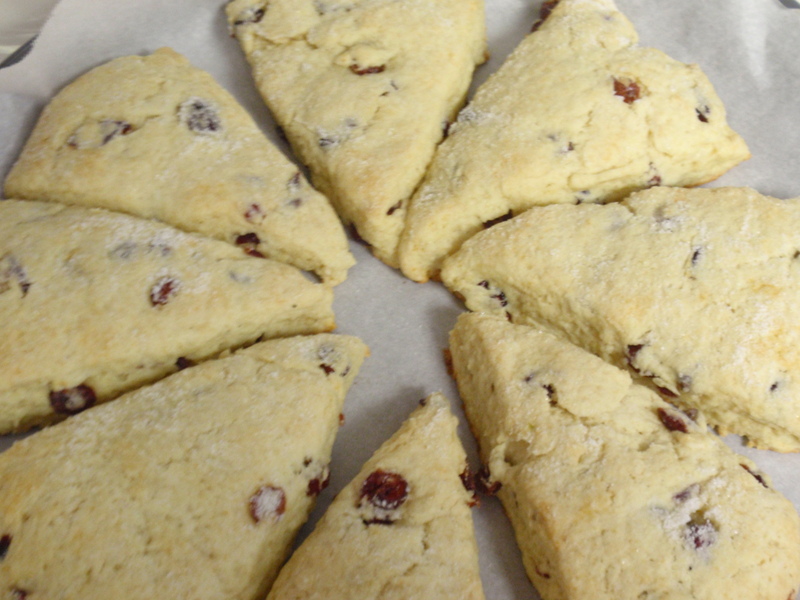 I had been wanting to make scones and my dad had brought dried cranberries from Turkey so I thought they would be put to good use in the scones. I’m sad I forgot to put orange zest in them because that would have been perfect! But otherwise they turned out pretty awesome. Preheat the oven to 400 F. In a large bowl combine the sugar, flour, salt, baking soda and powder. Grate the butter using the larger holes into the flour mixture. Using your hands, work the butter into the flour which should resemble a coarse meal. Stir in cranberries. In a small bowl, whisk together the egg and sour cream. Stir it into the flour mixture with a fork until large clumps of dough form. Using your hands work the mixture together so it turns into a ball. Dust a clean surface with flour and roll dough to a 7-8 in circle, 3/4 in thick. Cut into 8 equal triangles and place onto cookie sheet. Bake for about 15-17 min until lightly golden. Let it cool for about 5 min and serve with tea. I had just recently watched Ina Garten make a coffee cake and I came across a Rhubabr Coffee Cake which I just had to try since I’ve never had rhubarb before. It’s a little late in the season for rhubarb but the cake turned out well. I added in strawberries to balance out the tartness of the rhubarb. In a large bowl, cream together the butter, applesauce, and sugar. Stir in sour cream. In another bowl combine dry ingredients. Mix into the wet ingredients until combined. In a bowl, combine all ingredients until evenly moistened. Mix everything in a bowl until combined. Preheat oven to 350 F. Spoon half the cake batter in a greased springform pan. Smooth so it’s an even layer. Sprinkle half of the crunch topping over the batter. Carefully spread evenly the remaining cake batter. Mix together the fruit and crunch topping together. Evenly sprinkle over the cake batter. Bake in oven for about 55-60 min until inserted toothpick comes out clean. Cool before serving. I had never been a fan of fruits in salads or food that isn’t dessert-like. I didn’t understand why people did such a thing until I tried my friends CPK inspired Waldorf Salad and I was converted. Who would have thought that apples, chicken, grapes, cheese, salad, walnuts played so well together. It’s my favorite salad to date (even though CPKs Waldorf Salad is one of the most unhealthiest salads). Since then, I’m more open to fruit being in random dishes. 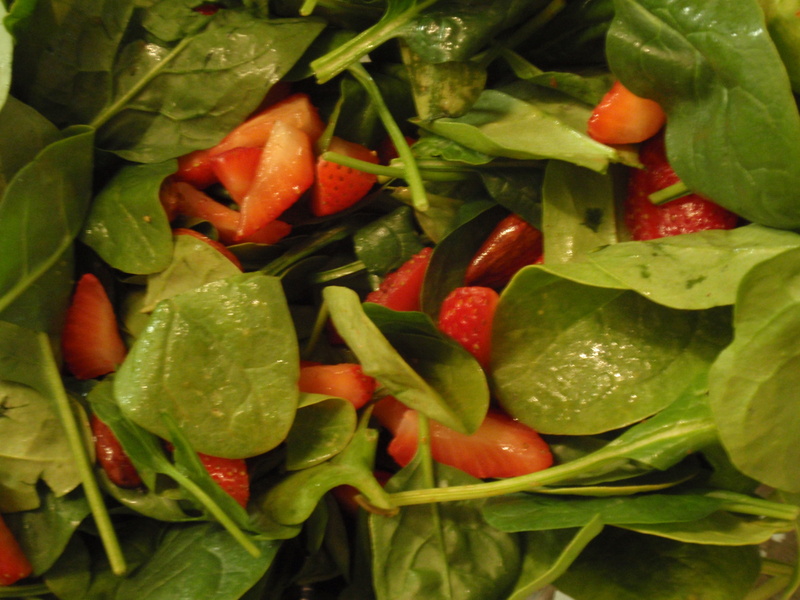 I had a ton of spinach leftover and with the constant stream of summer strawberries in my fridge, I just had to make this Strawberry Spinach Salad I came across. Strawberries are quite amazing berries. Not only are they wonderful in all the normal strawberry ways, they are amazing to make salsa with (sounds odd, yes I know but a must try! ), and in salads. Toss the spinach, strawberries, and nuts in a large bowl. In a small bowl, combine sugar, salt, mustard powder, poppyseed. 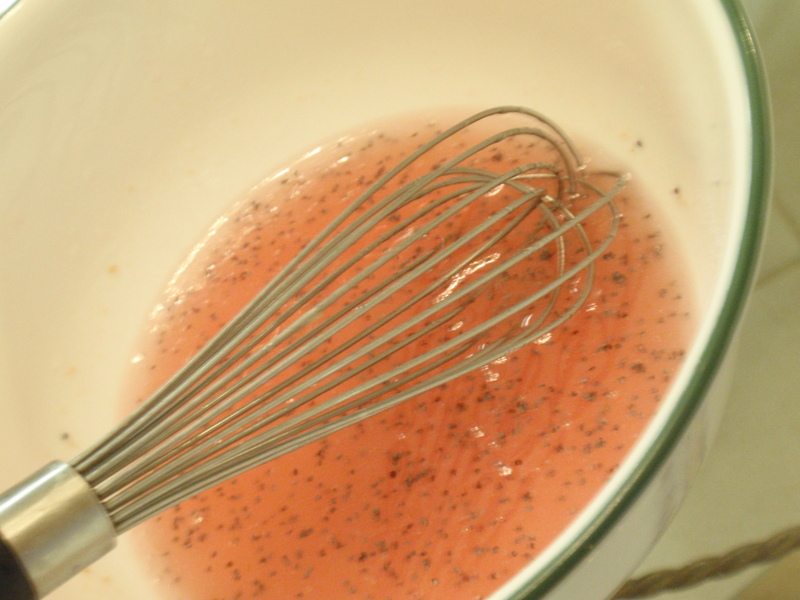 With a whisk, pour in the vinegar. Slowly whisk in the oil. Drizzle dressing as desired on salad. I took this bloggers advice as featuring this salad as a main dish with having sides of grilled corn, vegetables skewers, chicken, and roasted potatoes. It was an amazing dinner that was quick and easy to throw together that everyone in the house helped throw together. 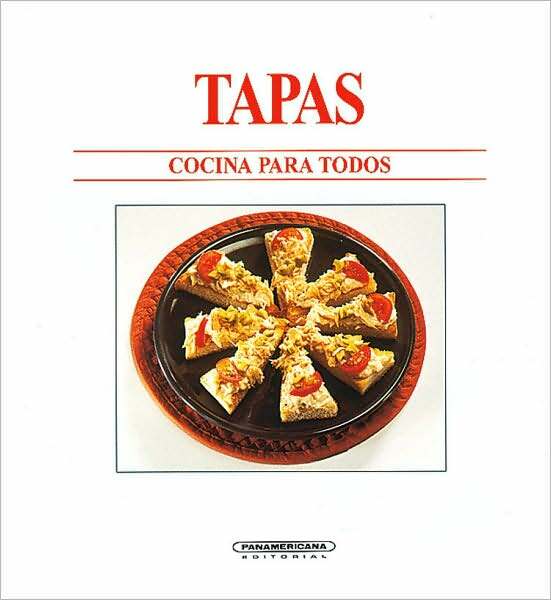 One of my friends just got back from touring Spain and was kind enough to bring back a cookbook for me. Can’t wait to try out the recipe. Thanks Egg! 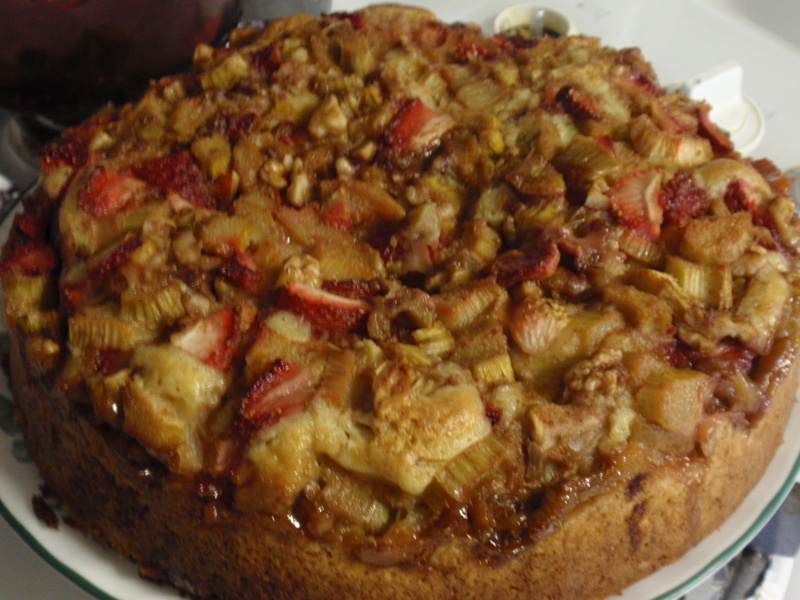 Today I will be make a Rhubarb-Strawberry Coffee Cake and hopefully Scones to bring to a brunch tomorrow. I’m really excited to finally try rhubarb! To kickoff summer and intense heat, I hosted a pool party at my place. I would have rather done it later in the summer but most of the summer is piled up with things to do and places to be. I can’t begin to describe how great hummus is and if you haven’t tried some, you’re severely missing out! 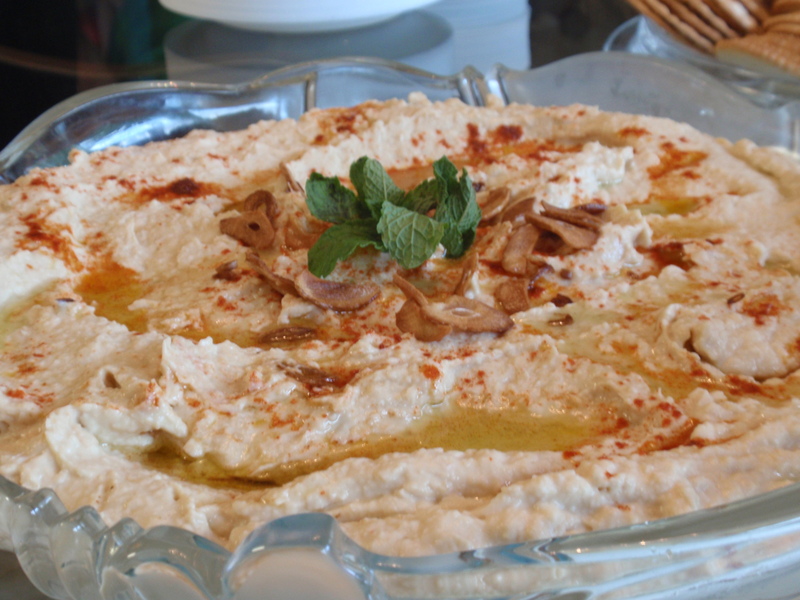 You can buy store bought hummus, but making it at home is fairly easy. The following recipe is a little bit more work and was a little bit too garlic-ky. I lovvvee garlic so if you like a milder garlic taste, I’d reduce the amount of garlic. If you’re using fresh chickpeas, soak them overnight in water. The next day boil them in the water till they are soft. Preheat the oven to 350F. Chop off the quarter half of the garlic heads and wrap in foil with a pad of butter on each head. Bake for about an hour. Meanwhile in a small skillet, heat up the olive oil in a small skillet and cook the sliced garlic till they brown. Using a slotted spoon, remove the garlic pieces and place on a paper towel to drain. Now mix the oil with the tahini sauce in a small bowl. In another small bowl, combine lemon juice and water. Remove the garlic heads from the oven once they’re done and squeeze out the garlic. The garlic should be soft enough to push through the skins. Discard the garlic skins. In a food processor, process the chickpeas, roasted garlic, clove of garlic, salt, and cayenne pepper. Occasionally scrape down the sides of the bowel to make sure everything is incorporated. With the machine running, add the lemon-water through the feed tube following with the tahini-oil mixture. Process everything till smooth. Empty out into a flat serving bowl and garnish with parsley, the browned garlic pieces, and olive oil. I was given the idea of making sliders from A Lil Nibble and it was a great idea indeed. I was worried about not being able to find mini buns but after some searching online, I found most people used dinner rolls. It’s not perfect but it got the job done. I used fresh baked dinner rolls from the local bakery and they went with the sliders. In a large strainer, lightly wash the ground beef. Make sure you squeeze out all the water properly. In a small food processor, combine the parsley and onion. Pulse till the parsley and onion are finely chopped. In a large bowl, combine all ingredients, making sure everything distributed properly. Taking about 1 1/2 tbs of meat, make small patties. Line a baking tray with parchment paper and place your patties on the tray. Once the tray is filled, you can add another layer of parchment paper on top and add more patties. I had about 37 patties made from 4 1/2 lbs of meat. On the grill or a countertop griddle, cook your patties on medium heat till its cooked through and each side is dark brown, about 4 min on each side. Heat your buns in the oven for a few minutes so they’re slightly toasted. 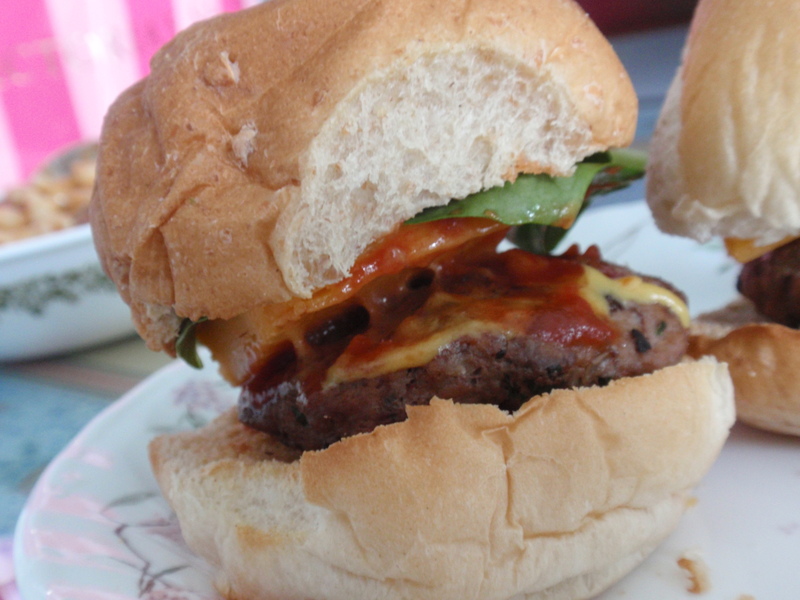 Assemble burgers with desired condiments. I used baby spinach as my “lettuce”, sliced my own cheese, and has basic condiments such as mayonnaise, ketchup, and mustard. Little Debbie snacks were much coveted when I was younger. I remember eating Zebra Cakes, Fudge Brownies, Strawberry Shortcake Rolls, Devil Squares, Cream Pies, Star Crunch, Fudge Rounds, and Swiss Rolls, the whole lot of them. 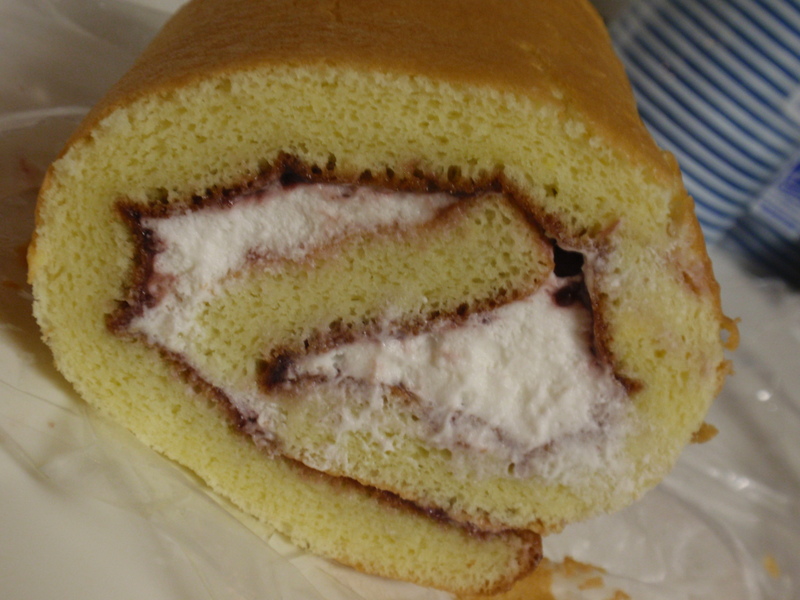 I haven’t had them in a realllly long time so I can’t compare the swiss roll that I made with Little Debbie but the ones that I made, were so light and not too sweet at all. It was almost like I was eating pound cake with a yummy filling. It’s like having an awesome piece of cake without having to feel too guilty about it. The original recipe covered it in chocolate which I opted to skip out but maybe next time I will indulge. Preheat oven to 350F. In a large bowl, whip together your egg yolks, 1/4 cup sugar and 1/2 tsp of vanilla for about 3 min, till the eggs looks pale yellow. Fold in the cake flour. In another bowl, whip together the egg whites with 1/2 tsp of salt until soft peaks form. Add in 1/4 cup sugar and beat still you have stiff glossy peaks. Fold the whites into the yolk mixture till there are no streaks. Quickly fold in the melted butter. Butter a large baking tray and line it with parchment paper, then butter the paper. Spread the cake batter evenly onto the tray and bake in oven for about 15-20 min until golden and puffy. While the bake is baking, in a bowl whip together 1/2 cup of whipping cream, 2 tbs sugar, and 1/2 tsp of vanilla extract till it form stiff peaks. Invert the cake on a large cutting board after it has cooled. Spread your favorite jam evenly all over the cake. Spread the whipped cream evenly over the jam, trying not to mix the two. Roll the cake carefully from the longside of the cake until you have reached the end of the cake. Scrape off any excess cream/jam that might have oozed out. Cover the cake with plastic wrap and place in fridge for 6 hrs or overnight. Once it has chilled, unwrap the cake and slice up the cake to serve. I’ve been wanting to make caramels for quite a while but most of the recipes call for HFCS which I’m pretty much against. I did find a document of really old recipes which I might try out. However, for the party I made a caramel sauce to pour over apples which was a sinch! In a sauce pan, add in the sugar. Pour the water onto the sugar with out mixing. 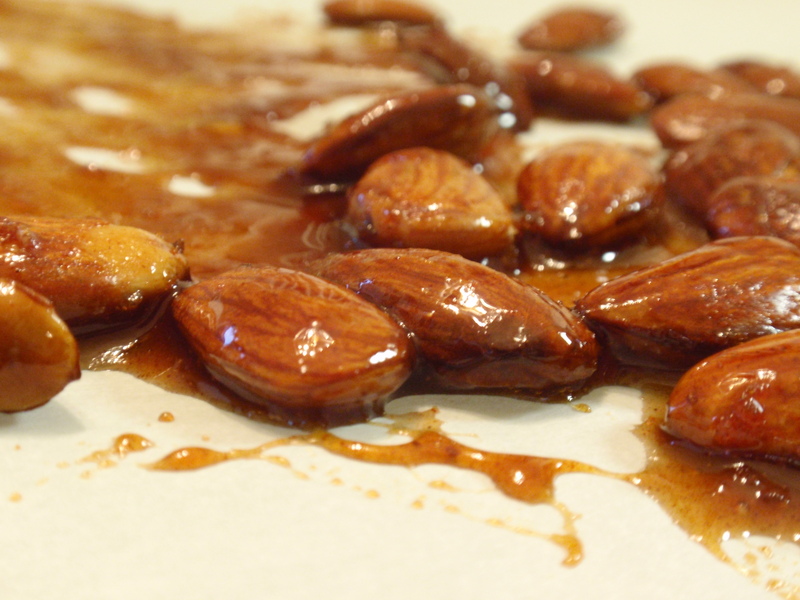 You don’t want to move the sugar around or it’ll crystallize and you’ll have grainy caramel. Turn onto medium heat and let it cook without stirring. While the sugar and water are cooking, make sure you have your cream ready to use and whisk on hand. Once the sugar has turned amber, pour in the cream which might splatter a little bit. Start mixing the mixture with a whisk until the sugar uniformly combines with the cream. Turn off heat. Serve warm or room temperature.